A sea sock is an amazing safety invention, particularly for skin-on-frame kayaks. 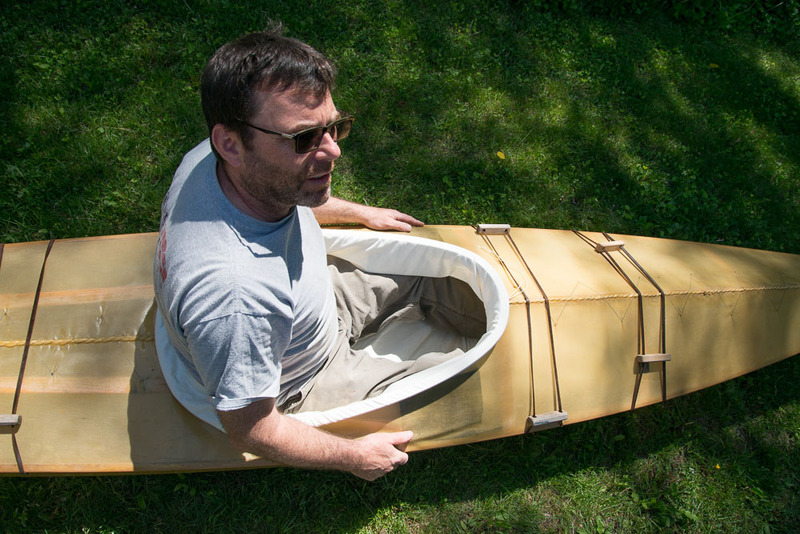 They keep water out of the boat if you capsize, and give your kayak tremendous flotation. Alas, there really is no good sea sock made for sea kayaks anywhere. 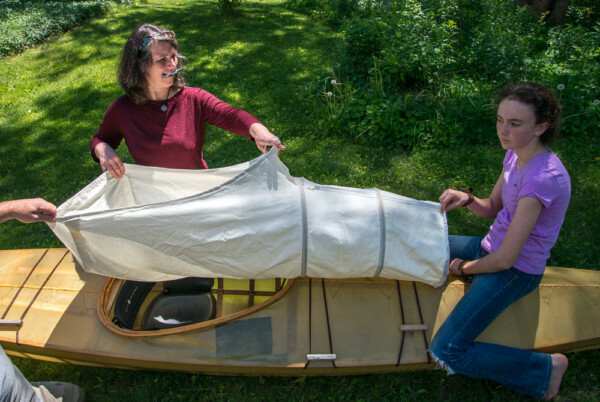 That will be ending soon, thanks to Seawolf paddler and textiles master Liz Hawkes. Available commercial sea socks are too big, install poorly, and generally wrap your lower body in clammy, non-breathable nylon. If you’ve wanted something reasonably comfortable and fitted, you’ve had to make it. Liz has been prototyping and constructing a newly designed sea sock with input from myself (Kiliii) and Paul Richards, who organizes our Boston-area kayak workshops. The second round of prototypes is just about complete, and fabrics testing is coming. Ties around your coaming with a small diameter cord, which allows you to install it on cockpits with a regular rim and have your skirt still secure around the coaming. Supported by an internal frame which keeps it from lying, clammy and sweaty, over your legs and lower body. Supported by a foam piece that is essentially a bulkhead– it is a standard size for Seawolf’s kayaks but will easily be user-modified for other boats. You can rest your feet on something comfortable, and the bulkhead’s position is set by your adjustable foot pegs. No need to install velcro or other doodads that fail after a while since the sock is self-supporting. Made of several material options right now: a waxed cotton tincloth, or a mid-weight nylon that is easy to clean and keeps moisture away from direct contact with your body. The sock currently has no name and we don’t have pricing yet, but we are gauging interest in these for the kayak community– they may be ready by September. Feel free to leave a comment or email us directly at kiliii (at) seawolf kayak (dot) com. I would be interested! I’ve wanted a seasock ever since building one of Brian Schulz’s F1’s, and despite receiving two different versions from a midwest competitor of yours, I still don’t have one that fits, and am out $150. The design elements of your model are very attractive and I look forward to hearing more about your progress. The only reason I have not taken one of your workshops and built a skin on frame is the lack of a bulkhead or good sea sock option. This would do it IF the sea sock attaches almost permanently to the coaming. I couldn’t risk it if it could come off in deep rough waters if I happen to go over and fall out. I definitely need a new sea sock. I recently acquired a feathercraft heron and it is missing the sea sock and this looks perfect. Definitely interested! Looking for an alternative to the very stiff and uncomfortable sea sock that come with my Feathercraft Wisper, and avoiding having to design one myself. I am interested in knowing if this will work with a Feathercraft kahuna. The original sea sock is at the end of its life and I am looking for a replacement. The lack of a reputable bulkhead has bothered me for some time, and I dislike float bags: a sock would fill the bill nicely. Please let me know details as they solidify. Please let me know when it is available. Hi there, I have a Mariner Coastal kayak and am wondering if this sea sock would fit it. Thanks!